Calvin (who is another student who lives in the same house as me) had told me about a big hill you can walk up to get a good view of Sucre, and kind of told me how to get there, so this morning, I set off in search of that path. 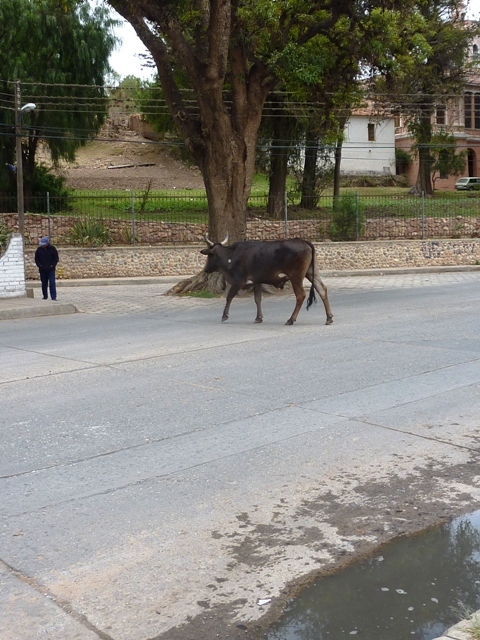 As I headed out of the pristine white city centre, the buildings became more ramshackle, a bull crossed the road right in front of my eyes (in the middle of a city!) and chickens stalked the increasingly disordered pavements around me. I was starting to feel a little uncomfortable about wandering so far (a ten minute walk) out of tourist territory alone, and it only took a couple of terratorial dogs with big gruff barks to convince me that I didn´t really want to climb a hill after all, and I certainly didn´t want to find out first hand if their barks were worse than their bites. What I really wanted to do on a lovely Sunday morning was sit in a cafe having a lazy lunch. And so that I did. For the first time since I left York, 8 weeks ago, I felt as if I was on holiday. Sucre is such a tranquil and relaxing place, where it feels more than OK to sit alone sipping on a jugo made of fresh stuff and reading a book, or just chatting to a fellow student who you bumped into on arrival at your favourite local cafe. Of course, I knew about the numerous tourist tours and attractions , but lacked any kind of inclination to go ahead and do them, instead content to wander past the museums on my way to buy fresh fruit from the market, or find another cafe or plaza to while away a lazy afternoon. Wandering around Sucre in the midday heat, I felt a bit thirsty. Nothing to do with last night´s mojitos I´m sure. I followed my nose, as is all that is necessary to do in Sucre – around every corner the rich scent of oranges meets your senses and tells you which direction to travel in in order to find a man or woman with a cart full of oranges, ready to squeeze you a fresh juice for 30p a cup. Sluuuurp! 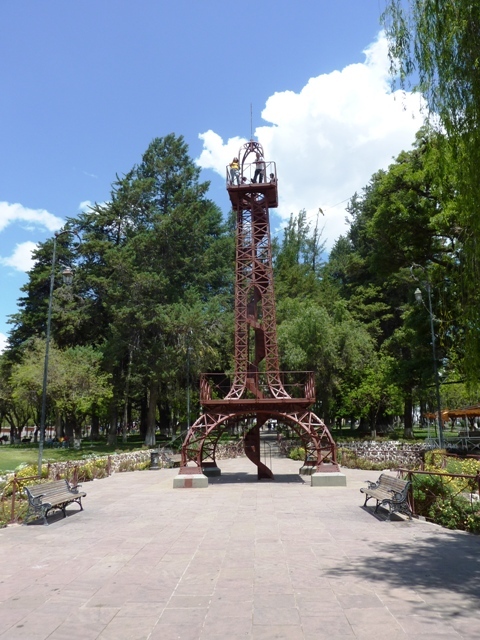 I had been in Sucre for almost a week, yet still hadn´t seen the Eiffel Tower and so, in an attempt to have something to say when I was asked what I did at the weekend in my next class, I walked to Parque Simon Bolivar and looked at the Eiffel Tower. I didn´t climb up since there were people snogging at the top, and I didn´t fancy negotiating the narrow spiral staircase whilst wearing a skirt. I would just have to make do with the fact that I had already been to the top of a big metal tower in Paris instead. Later that evening, I met up with some of the others from the school because we heard that there was going to be some kind of big parade. 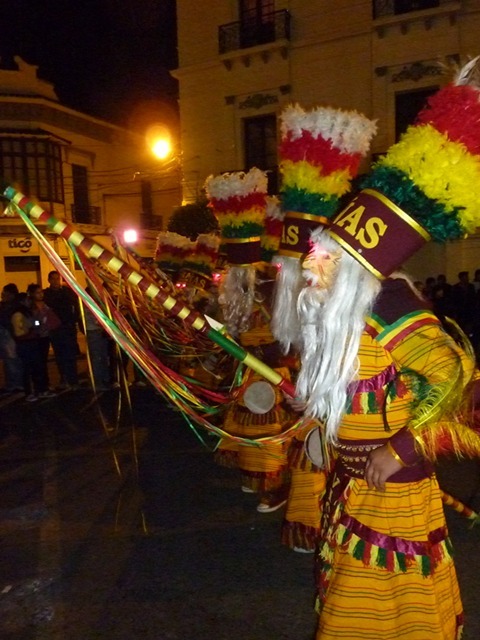 It started on the outskirts of the city at 1pm that afternoon, and by 8pm the dancers, who had been dancing their way through the streets of Sucre in brightly coloured costumes, adorned with feathers, sequins and impractical hats and shoes, reached Plaza 25 de Mayo. Seven hours after they had started this epic journey, they still looked as fresh and exciting as they must have done when they started. 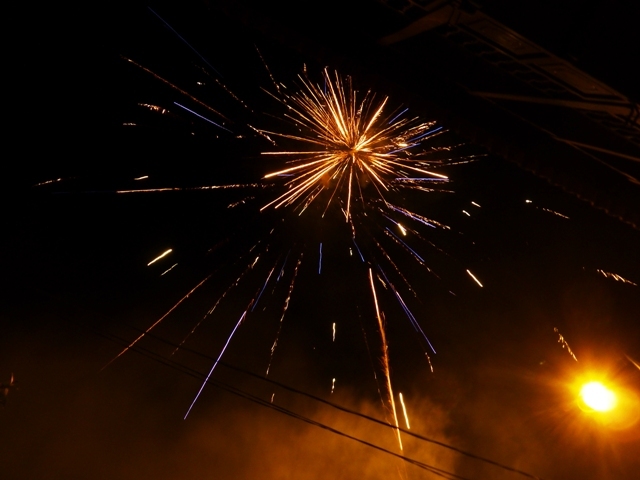 Intermitently, a large brass band would march past, playing the same tune as the musicians before them, and those that would come after and some of the groups would let off fireworks, dangerously close to the crowds which were gathered in the bandstands at the sides of plaza. 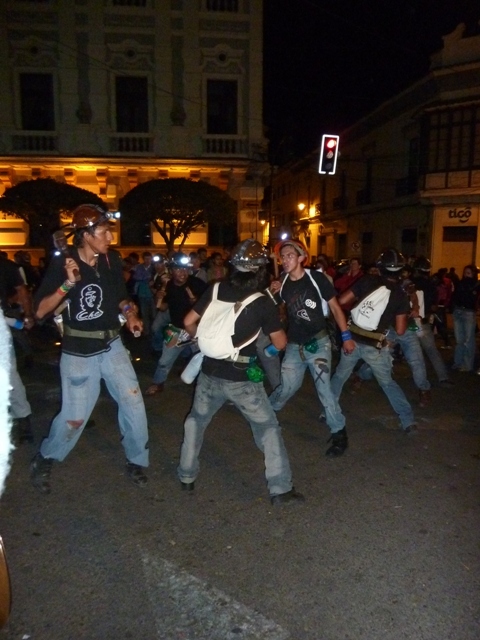 Of and apparently, dressing as a miner is now a legitimate fancy dress and dance costume. After an hour or so of parade, we disappeared into a nearby pub where we received the worst bar service I have ever encountered while everyone around us danced to dreadful music (you know, that loud stuff that the young people listen to – all sounds the same…) in their various halloween fancy dress guises. 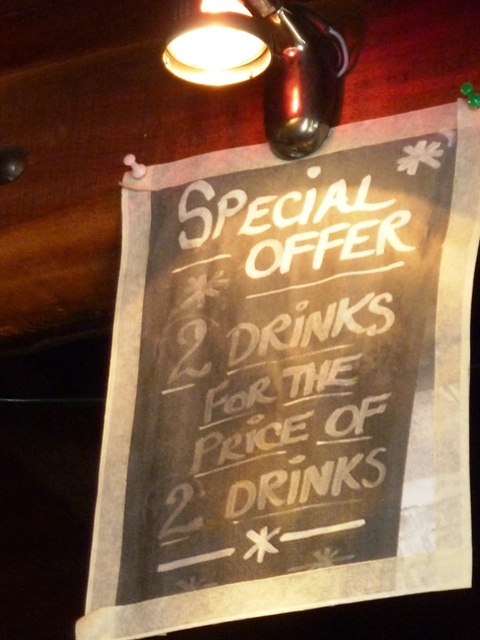 Because of this, I ´only´ stayed out until 1.30am and then walked home in a rain storm that England would be proud of. This used to be a brilliant post full of wit, insight and long words. Then the Bolivian internet decided to delete it, so now it will be a below average post, full of me being annoyed about having to write it again… still, serves me right for trying a different internet cafe… stick with what you know, that will be my motto from now on. 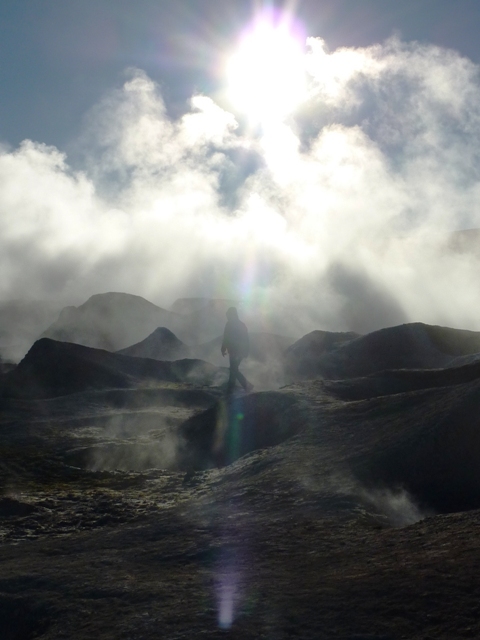 Which kind of goes against the grain of the whole travelling thing. Good thing I´m going home in two weeks! Maybe I´ll stop ranting and write something about the Fox Academy Halloween party (again) instead. Tonight was the Fox Academy Halloween party, and in the absence of a costume, I popped back to the house to change my floral dress for some black things and threw an eyeliner in my bag, finally feeling justified in bringing a make-up bag along with me, because this meant that I had finally opened it! 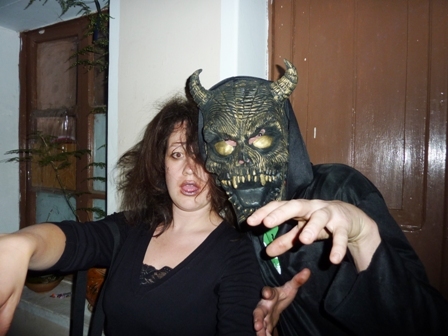 On arrival at the school (and out of sight of the ´normal people´ on the street, I quickly backcombed my hair, Edward Scissorhands stylee and drew on my face with black eyeliner until, hey presto, I was a zombie. Which is more effort than some of the other students had gone to – most of them came as tourists. After class, I went into the school office to meet Jorge who took me in a taxi to his house where I would be living for the rest of my stay in Sucre. Centred around a small courtyard, a few different families seemed to share communal areas, and us students (of which there are 4 living in the building) had our own kitchen to use, or could opt to eat with the family for an extra few Bolivianos. I was sharing the basement floor with Claudia, from Switzerland, a curtain separating our own private spaces. It seemed to offer the best of both worlds – the chance to meet other students and have your own space, as well as the benefits of living with a host family. 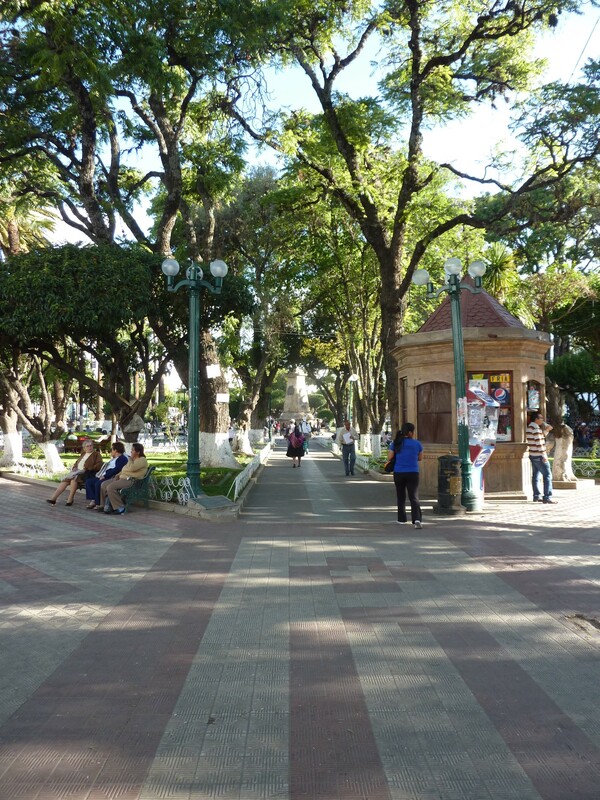 Once I had moved my minimal things in and chatted briefly to Claudia who was just home for a short while to get her things together for her afternoon class, after helping out at a local orphanage all morning, I headed out into town to see what all the fuss about Parque Cretácico was. I hopped on the ´Dino truck´outside the cathedral with a group of other tourists and we had a 20 minute ride to the ´park´just outside of Sucre which is, in fact a quarry where workers discovered approximately 500 dinosaur footprints from at least 4 different dinosaur families whilst they were digging the quarry back in the ´90s. Although the footprints themselves weren´t that impressive, it was kind of cool to see them dotted all over a vertical wall and to think that, back in the day of the dinosaurs, that wall was horizontal until a couple of tectonic plates smashed into each other and caused the surface of the earth to be pushed up to this new vertical plane as part of the mountains that were created all those years ago. It was also nice to be reminded that nobody really knows what colour or texture dinosaurs were, and the greens and browns which are so often illustrated are complete guesses. If I was building plastic dinosaurs, I´d be tempted to make them with pink, orange and yellow stripes, just to brighten the place up a bit. The Amigo hostel seems to get quite bad reviews on the internet – apparently for its rude staff, meagre kitchen facilities and dodgy light fittings. 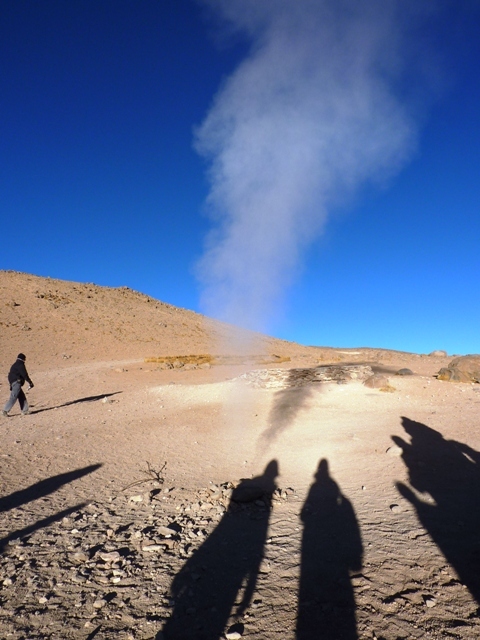 Though the staff hadn´t been rude to me, I did feel that there was a general difference between the people I had encountered who worked in hostels in Bolivia, to the numerous open and friendly people I had met in Peru. I got the impression this was maybe because, like people from my own country, maybe the Bolivian people are a little more reserved and take longer to get to know you. On the other hand, regarding the reviews of the hostel, I did have to go to 5 different bathrooms before I found one with a light that worked and a door that would shut, just so I could have a shower, and the pitiful facilities offered in the communal kitchen certainly didn´t live up to their reputation as a kitchen – e.g. there was no fridge and the oven didn´t work. Though this provided entertainment value as I watched a group of English lads try to cook chicken nuggets, taking it in turns to hold in the knob on the oven in to make it stay on, it didn´t really make for a convenient place to live for the next few weeks, so I resolved to sort something else out that afternoon. At 9am I arrived at the building where my class would take place and knocked on the door. A woman opened the gate. “Tengo un clase.” I said to her. “No estan aquí todavia,” she said, and shut the gate in my face. I stood there in the few seconds it took for a teacher to arrive thinking about how I missed Peru and that if I was there right now, I would probably sitting inside the courtyard with the woman who answered the gate discussing everything I´ve eaten in the past week, and everything I plan to eat for the next month. Maybe, I thought, Peru is just more friendly. On the way back to the hostel after class I popped into a shop to buy a notebook and was finally greeted by someone cheerful and friendly and very concerned that I keep an eye on my bag at all times. 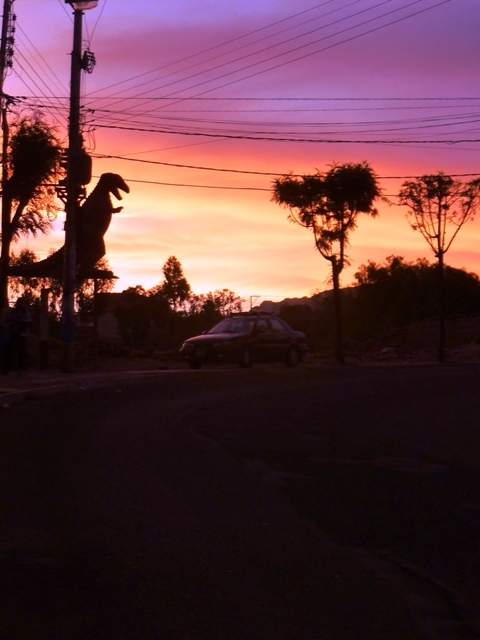 She restored my faith in the Bolivian people and convinced me that maybe I´d just been unlucky so far. I turned up at 9am for my next 2 weeks of Spanish classes to meet my teacher, Delia who had proper traditional Bolivian lady plaits complete with decorations tied into the end. She led me to a classroom a few blocks away from the school while we talked for a bit so that she could assess where I was at in the whole language learning process. And then I wrote a story (in Spanish) about a tortoise who couldn´t find any lettuce to eat because the rabbits had eaten it all. Following the lesson, I spent a happy hour relaxing on one of the terraces at the hostel, before deciding that I really should get out and see a bit of Sucre, if nothing else to have something to talk about in tomorrows class. 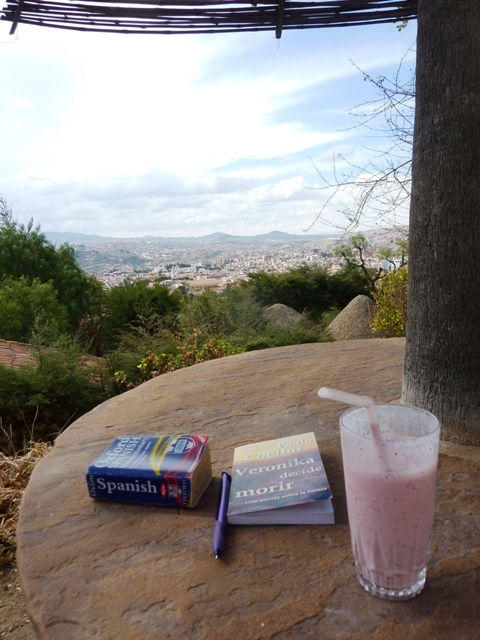 I picked up my map and set out in search of the Mirador Recoleta which promised nice views overlooking the city. This should have been my clue that there just might be a few big hills to walk up in the afternoon sunshine, so I should probably swap my jeans for something lighter, and my flipflops for something heavier, but I didn´t take the hint, and so found myself struggling up the hills towards my destination. Fortunately it wasn´t too far away and I soon heard the sounds of children playing and rounded a corner to see a big open plaza where a group of boys were having a kick-about. At the nearside of the plaza were the mirador arches, overlooking the glossy white colonial centre of Sucre, with modest mountains framing the backdrop. Just below, I spied a cafe so I popped in for a sneaky jugo de frutilla con leche and sat on one of the deckchairs reading my book for a few hours until the sun disappeared behind a cloud and with it, the warmth of the day. Sucre is built around an attractive large plaza which, like Arequipa has its fair share of pigeons, but unlike Arequipa seems to maintain a calm and tranquil aura about it so you can actually do things like sit and read, or write in your diary without being bothered by flocks of pigeons, or interrupted by people just wanting to sit and chat. The colonial white buildings that give Sucre its nickname, ´The White City´have to be whitewashed every year, which makes sure that all the buildings always look fresh and shiny and new under their red tiled rooves. Sometimes, if you are lucky, you might round a corner to find a plastic dinosaur staring at you. Sometimes that dinosaur is a phone box, but other times, it is merely for decoration. Yet again, I had found a city I could live in and so was very glad that I had chosen it as the place I would stay for the next few weeks and learn more Spanish. I could have done some touristy stuff today, like go and see some dinosaur footprints or visit one of the many boring museums, but all I really wanted to do was rest for a while, drink beer and eat food in a gringo cafe, stare at a computer screen, buy a bottle of wine with a cork and then realise that there´s no corkscrew anywhere, sit alone on the rooftop terrace of the hostel for a while not talking to anyone and not imprisoned on a bumpy bus ride, and to feel FREEEEEEEEE! Well rested, I headed out for breakfast before my 10am bus to Sucre, glad that I decided not to take this particular journey last night. At the bus station, as I watched battered old buses drive up and down the road, I began to think that maybe I shouldn´t have just bought a ticket from the first office I came across with the word Sucre splashed on its posters, and perhaps checked which kind of bus I might end up on. In general, travellers in South America do tend to check the facts about night buses they might take, but aren´t so fussy when it comes to spending all of their daylight hours on the bus. It doesn´t quite make sense, but it seemed like I was fitting in nicely with that generalisation. I was relieved to be directed over to a bus outside the agency next door, which at least stored luggage under the bus instead of on the roof and only had a tiny crack in the windscreen. There were some other tourists on it too. As expected, the road to Potosi hadn´t really been finished, so we set off on more bumpy, winding mountainside dirt roads, occasionally passing the diggers that were evidently working (not very hard) on building the road we were travelling on. The scenery: still very deserty, shades of pale brown and faded yellowy green in every direction. At one point I was surprised and delighted to see the dirt track transform into a stretch of proper road, but it was short-lived, and soon the comforting grey asphalt disintegrated into dust between fields of grazing llamas, and we didn´t see any more ´proper´road until we arrived in Potosi. 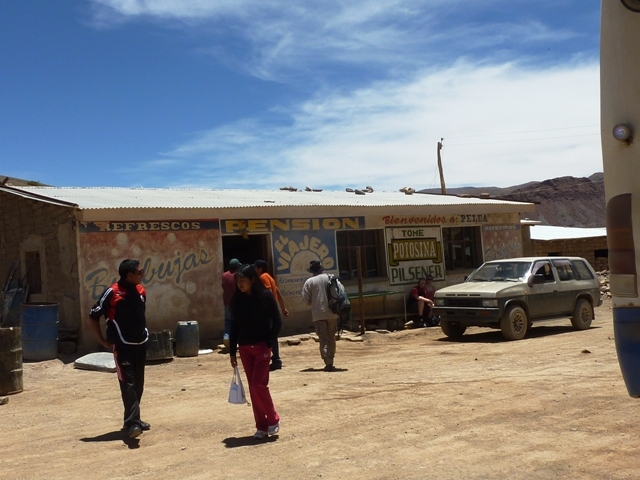 As with the other Bolivian towns that I´d experienced (admitedly not many to date), Potosi was made of a jumble of disorganised buildings, clustered treacherously on the steep hillsides of the highest altitude town in the world. 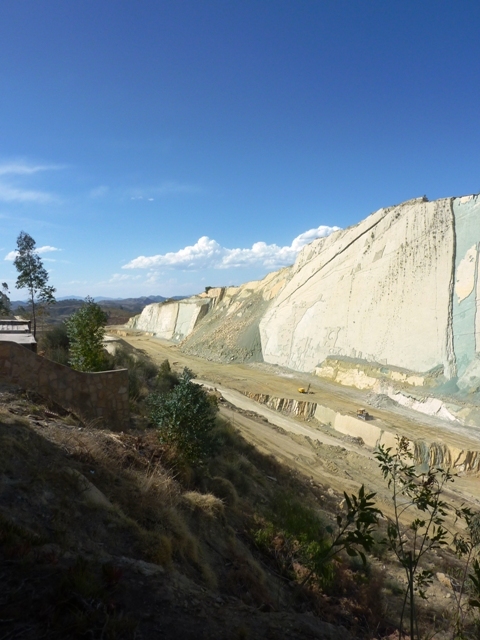 Constructed at a time when they found rich deposits of silver in the nearby conical mountain, it is now a stop-off for those on the gringo trail, looking to visit the mine and learn of it´s tragic history. What followed was a 10 minute private bus ride where I wondered what the hell was going on, and became increasingly concerned that I was going to end up back in Uyuni, or maybe locked in a big bus garage for the night while they went away and forgot about me, so it was a huge relief to arrive at a big glossy bus terminal where I discovered that I would indeed have to change buses and my connection was due in about 2 hours time. The final three hours to Sucre were a little more onerous. I was sitting next to a local who smelled like she hadn´t washed for a while, and who was taking up both her seat and half of mine, leaving me squashed uncomfortably next to the window, with very little leg room to boot. After staring out of bus windows all day at so many shades of brown, yellow and sunbleached green, I started to crave something a little bit greener. Eventually, more trees did start to appear in lusher shades of green and shortly after that, we arrived at an attractive city full of white-washed buildings. After all, I refuse to learn Spanish in a city that doesn´t have the nickname ´The White City´ (during this trip anyway!). Due to frustrations with the Bolivian internet, I hadn´t booked, or even properly researched a place to stay and was kind of expecting a queue of money-hungry taxi drivers at the station offering to take me to a lovely central hotel. Unfortunately this wasn´t the case, in fact, taxis seemed to be strangely scarce and I had no idea what to look out for in terms of the ´safe´ones so I set off walking down the busy road (or at least on the pavement next to it) having read that there was a hostel a 10 minute walk downhill, but failed to find it without a map or any kind of address to work with. Still no taxis in sight, so I kept walking, 15kgs of luggage on my back and another couple on my front in the vague direction that the bus had come from until I found the Plaza 25 de Mayo (i.e. the centre of the city) and opened up my ipod which had a city centre map of Sucre downloaded onto it. There, staring at me from the screen was something called “Amigo Hostel” which I knew to get terrible reviews on the internet, but also seemed to be close by. So I went straight there and got myself a dead cheap room and a hot shower, where I could make use of their LAUNDRY SERVICE (hooray! I´ve only being trying to do my laundry for a week!). Feeling tired, and a little faint from the strenuous walk, combined with not really having eaten anything but peanuts and a chocolate bar since breakfast, I drank some water, threw a few more peanuts in my mouth and abandoned the thought of going out to find food. For now, all I wanted was a shower and to sleep and that is what I did! 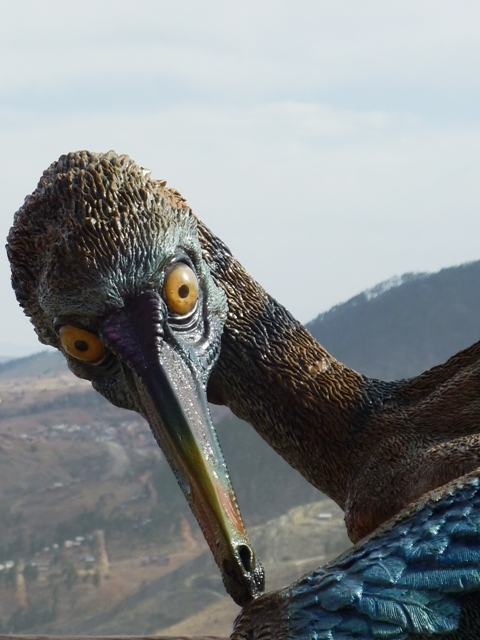 Going back to the fact that I did no research whatsoever about the Uyuni trip, I didn´t really know where San Pedro was when it was offered as an extra alternative to going back to Uyuni. If I´d had realised that it was in Chile, then I might have left the salt flats trip as the last thing I did in Bolivia, and headed back to Lima via Chile to save going back on myself , but I didn´t and so instead I spent a loooooooong time being bounced around in the back on a 4wd doing nothing but heading back to a town where my only aim was to leave as soon as possible. 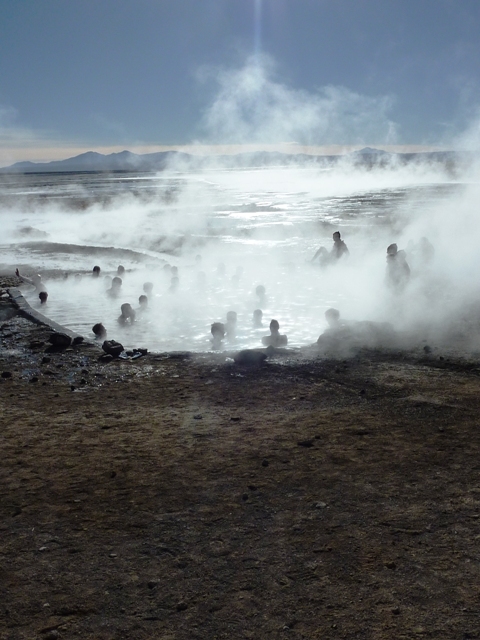 and the more sensible amongst us walked towards the more impressive and dangerous looking bubbling pools of mud and steam just down the road. After that, we were dropped off at some natural hot springs where I discovered that I only had half a bikini with me (the bottom half in case you are interested) and so while the majority of people stripped down to the swimmers and jumped straight in to get respite from the cold morning air, I went for tentatively dipping my toes into the hot water and allowing it to gently warm them while watching others splash about near me. After a cramped breakfast, we drove on towards the Chilean border, with Edwin sharing snippets of information, for example ´behind that volcano is Chile´and ´see that group of mountains over there? – that´s were Argentina is.” At about 11am we dropped our German contingent off at the Chilean border (now why didn´t I think of taking that option?) 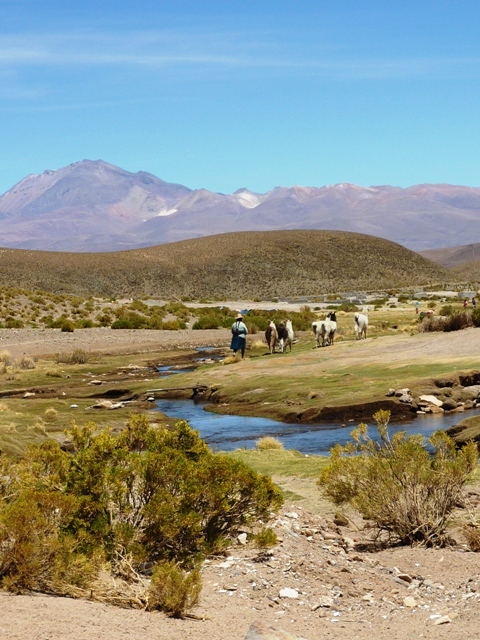 and the rest of us spent the next 6 hours in the 4wd heading back to Uyuni, only stopping briefly for lunch. Since the car was a little more empty, I took the back seat to myself and lay down to ´enjoy´ the bumpy bumpy ride back to where we came from. Occasionally I popped my head up to see if the scenery had changed from deserty desert to something more interesting, but it never did. Back in Uyuni, Linny and I decided that we certainly weren´t getting on another moving vehicle until at least tomorrow, so checked into a nearby hostal for the night and then went to sort out bus tickets and dinner. To finish the evening, we bumped into Linny´s Swedish friends and the rest of their tour group, so joined them for a final drink before bedtime. 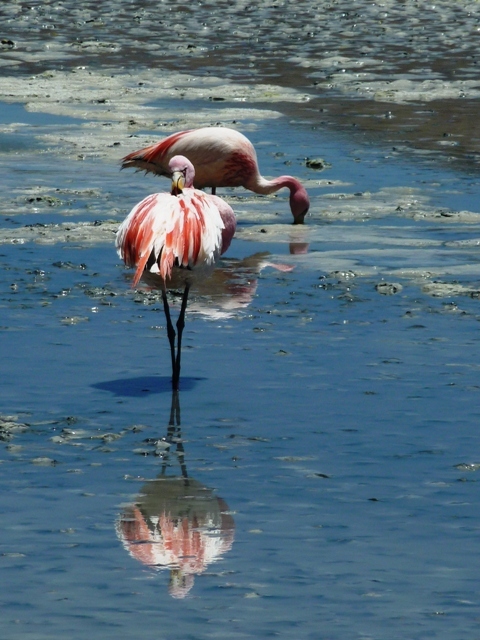 Today was less about salt and more about flamingos and lagoons. 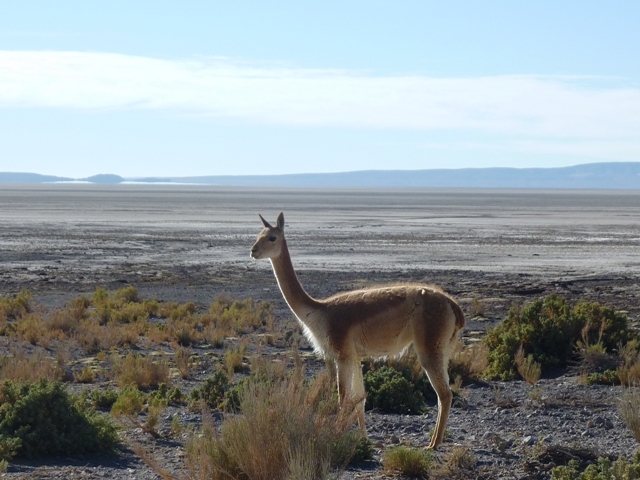 Given that I´d done very little research about Bolivia, and that I´d elected to ´do´the Salar de Uyuni because I had once seen a photo of it that looked nice, I had no idea that days 2 and 3 would be more about deserts and flamingos than salt. I suppose three days of salt might have got a bit ´samey´. But before we arrived at the lagoons and the pink attractions of the day, we drove through increasingly deserty landscape, making a brief stop so that Edwin could screw the wheels back on the 4WD, and another to photograph the grazing vincuñas, and one for a quick look at a big volcano before arriving at our first lagoon (which gave off a faint smell of sulphur) where clusters of pink flamingos chilled out on one or two legs, occasionally dipping their head into the sapphire water. Presumably for a bite to eat. We sat behind our 4WDs eating lunch there, while gulls circled around us eagerly looking for scraps of food to swoop down on. 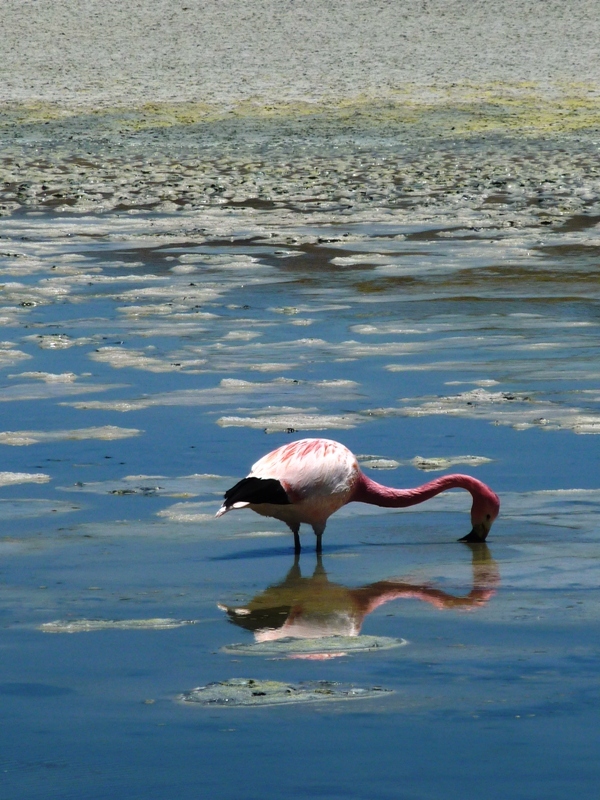 And then we went to another lagoon to see more flamingos. But this time they were closer. 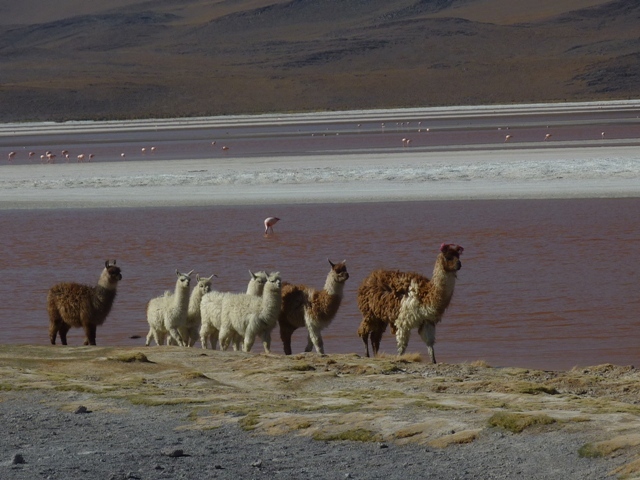 Later that day, we paid a steep fee to enter la Reserva National de Fauna Andina Eduardo Avoroa (wow, that´s a bit of a mouthful) where we were greeted with the sight of Laguna Colorado, where alpacas were grazed on the shores and flamingos flamungoed* in the brick red water. Finally, we arrived at our stop for the evening where our tour information told us it would be VERY cold because we were sleeping at a high altitude. As I snuggled down into bed, I couldn´t see what all the fuss was about. I was perfectly warm and I was only wearing a pair of wooly tights, pyjama bottoms, socks, a pyjama top, a hooded fleece (with the hood up), a thermal hat, a neck gaiter pulled up to my nose and a pair of thermal gloves, and I was only covered by 2 sheets, 2 blankets, a sleeping bag and a sleeping bag liner. It wasn´t cold at all! *what do you mean, that´s not a word? !